Happy May! 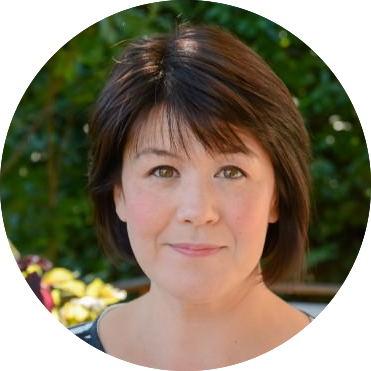 Life has been throwing some challenges my way, so I have been trying to figure out how to cope with everything. I woke up last Friday with a swollen and rashy face and have been trying not to itch myself out of my skin ever since. In my excitement to use a fifteen percent coupon from Sephora, I apparently tried one too many skin care products at once and had a huge allergic reaction to something. I’m trying to look at the bright side and tell myself that once I recover my skin will be bright, shiny and new since currently, it’s sloughing off in huge snakeskin like sheets. The things we do to keep father time at bay. We are expecting an eighty-degree day today, and that is pretty unheard of this time of year in Portland. I’m planning on clocking some time in my newly planted vegetable garden and soaking up some sunshine. It’s so nice to feel the sun after such a long time indoors. I love Portland but it’s around this time of year after weeks of gray and rain that I question my decision to call this city my home. With Cinco De Mayo tomorrow I thought I’d share one of my favorite Mexican dishes with you. 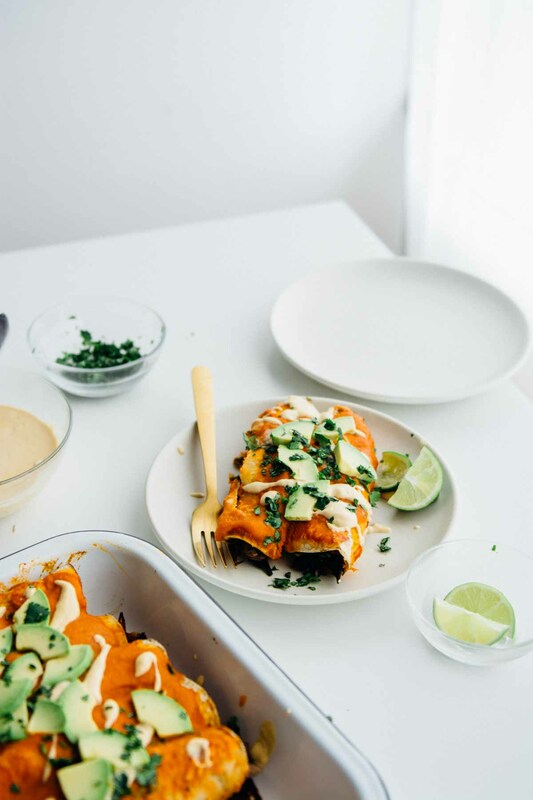 These enchiladas are really easy to put together and are the fillings are highly customizable. I picked up some lovely kale raab at the farmers market, but any leafy green will work well. Chard, spinach pea shoots, something that will wilt down nicely. 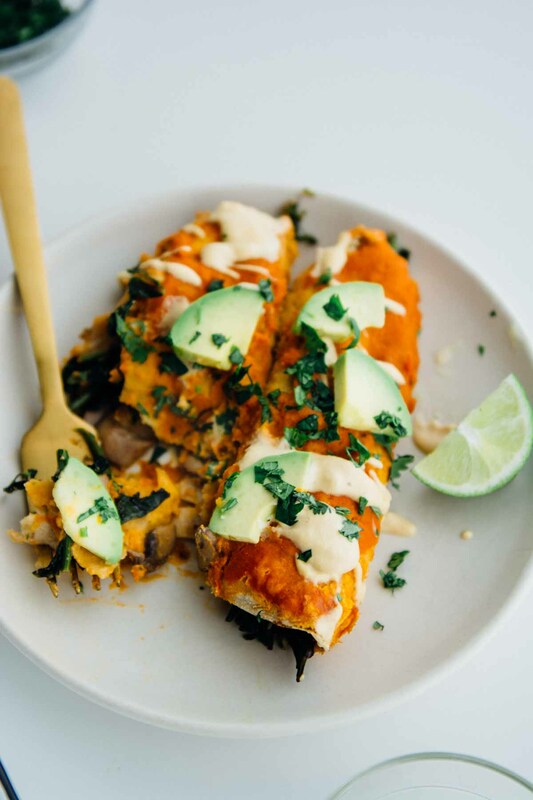 You could also add some roasted squash, rotisserie chicken or shrimp to the mix and a little touch of cotija on top if you do the cheese thing. My son is a dedicated carnivore so I made a double batch and added two cups of cooked carnitas to his tray. The sauces are the star of the show here. 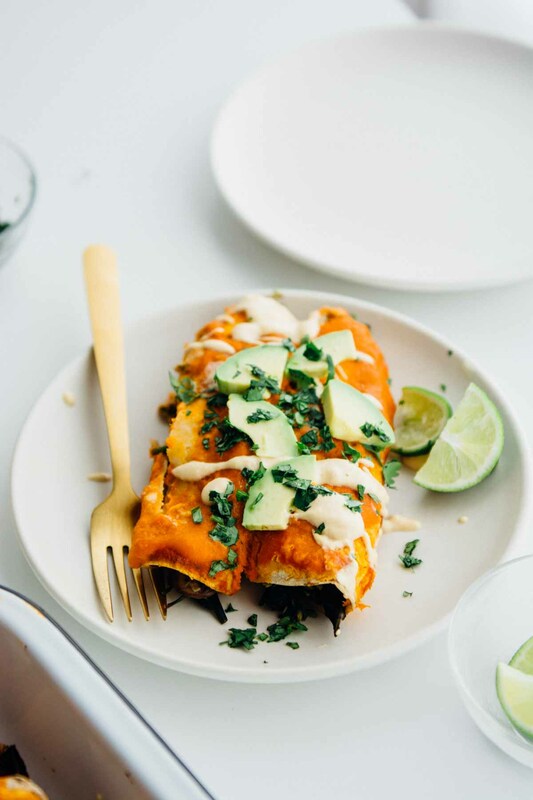 The enchilada sauce is one of my favorites, and I use it as a topping for tacos and bowls as well. The addition of cinnamon, honey, and chipotle makes for a sweet and smoky interplay that I just adore. The cashew cream can be used in a lot of different ways, we add it to our favorite grain bowls, it makes a great dip for chips or crudites and makes a great topping for eggs. 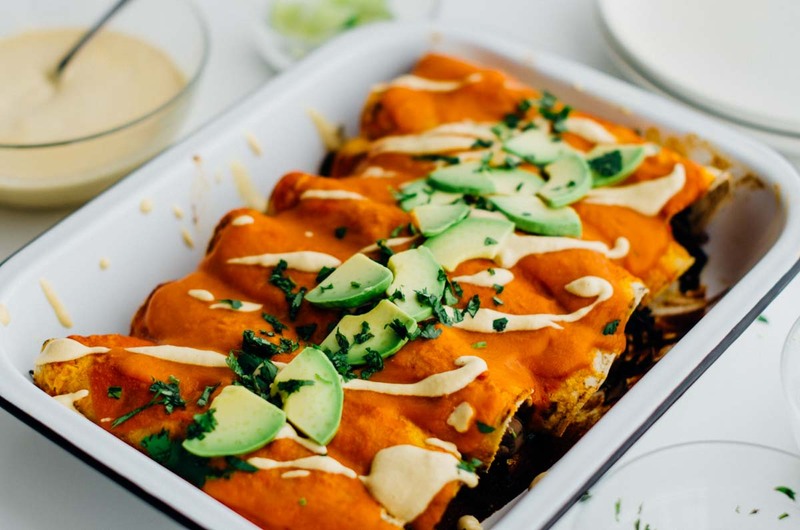 These are lighter and healthier and I honestly never miss the cheese and even better, I don’t have that need for a post-meal nap that I always get after eating traditional enchiladas! Check out the video to see how easy they are to put together! 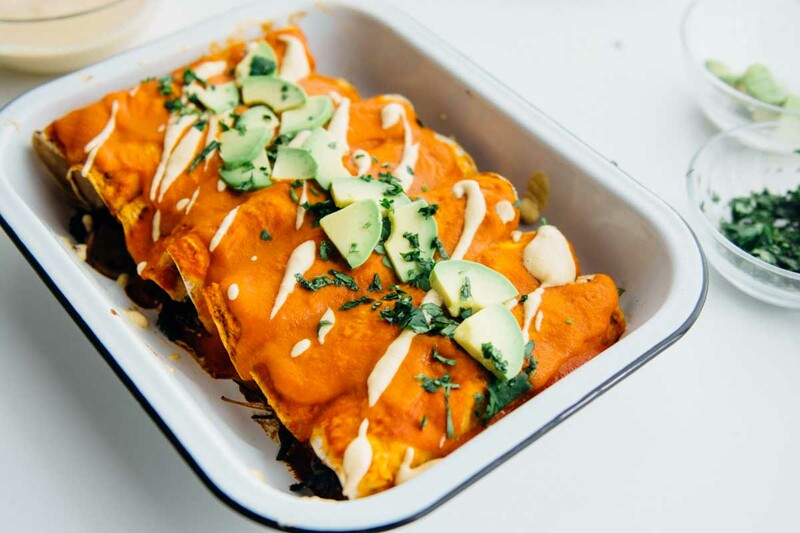 These vegan enchiladas are easy to make and freeze well. 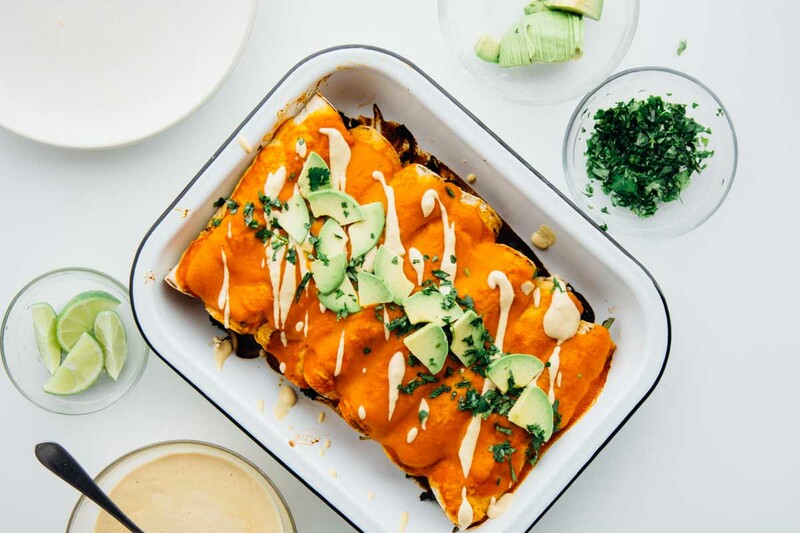 Full of veggies and topped with a sweet and spicy quick enchilada sauce you'll never miss the cheese! Heat the avocado oil in a skillet over medium heat and add the shallot. Cook, stirring frequently until translucent, about 4 minutes. Add the garlic, chipotle, honey, cumin, cinnamon and salt and cook for another minute or so until fragrant. Add the tomatoes, reduce the heat to a simmer and cook for 8-10 minutes. Transfer the mixture to a blender and blend on high until smooth. Taste and adjust adding more honey, salt or adobo sauce if desired. 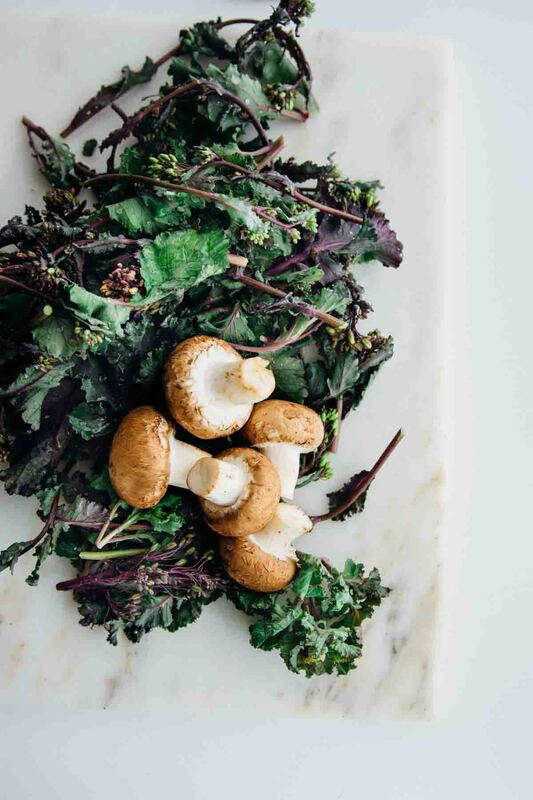 Heat a tablespoon of avocado oil over medium heat and add the mushrooms along with the salt and cook over medium heat until the mushrooms have released all their liquid and they begin to brown. Add the garlic, kale and a tablespoon of water and cover with a lid. 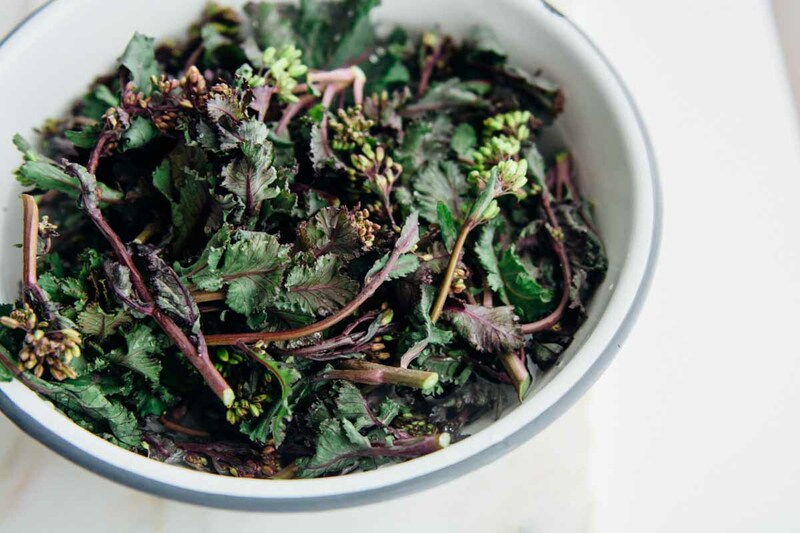 Let the kale steam for 2-3 minutes, remove the lid and continue to cook until the kale is softened and all the water has evaporated. Pre-heat the oven to 350 degrees. Wrap the tortillas in a slightly damp tea towel and microwave for one minute to soften slightly, this will make them easier to roll. Pour a bit of sauce in the bottom of a 9x13 pan and spread to coat. Take a tortilla and lay it in the bottom of the dish, layer a ¼ cup or so of the filling on the bottom third of the tortilla and then roll up to encase the filling and place seam side down. Continue to fill and roll the rest of the tortillas then top with a cup of the sauce. 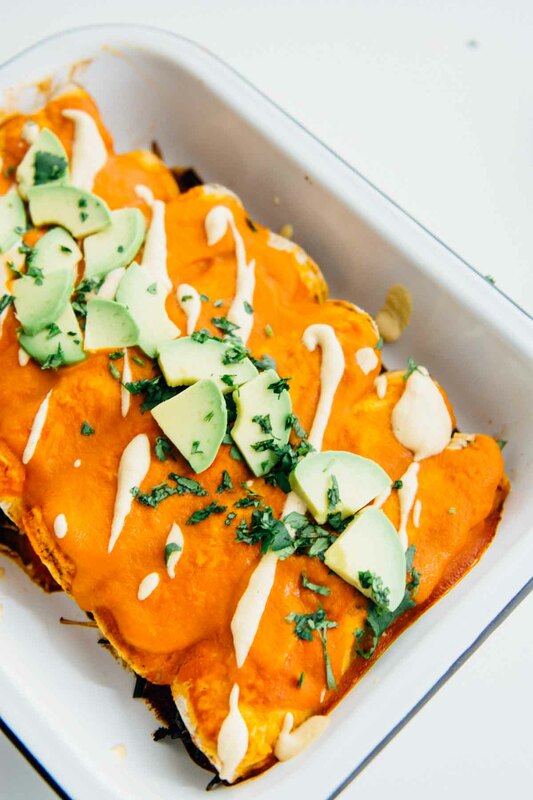 Bake the enchiladas for 15-20 minutes until warmed through. 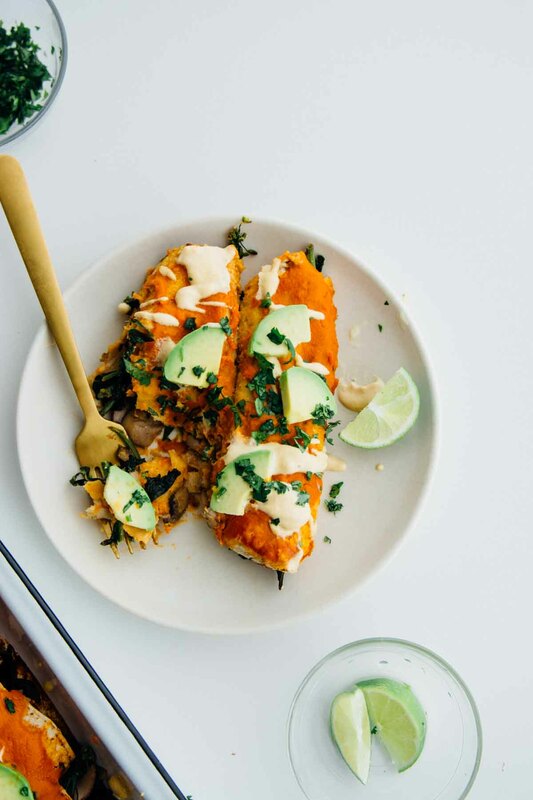 Top with a bit more of sauce if desired, drizzle with the cashew cream and top with cilantro and avocado. Serve with a few slices of fresh lime if desired. Drain and rinse the cashews and add to a blender along with the chipotle, garlic, nutritional yeast, lime juice, salt, and water. Blend on high until smooth and creamy, adding water a tablespoon at a time to achieve a pourable consistency. Meat Option: Add 2 cups of rotisserie chicken, carnitas or shrimp to the vegetable filling.